Stoltzekleiven is a special race. Racing up Stoltzen is proof that races don’t have to be the longest, the most remote or the most difficult to be truly tough. 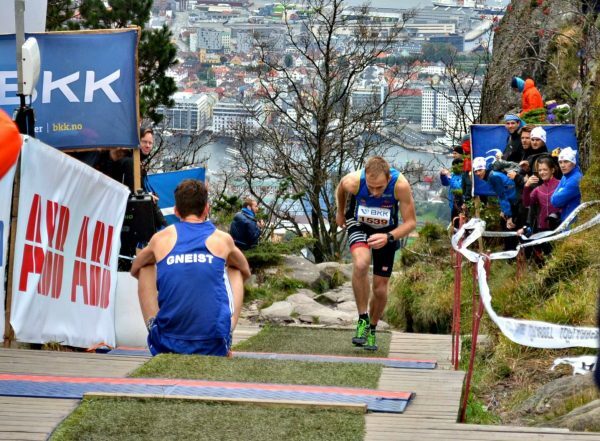 You just need a challenge that competitors are willing to push themselves through hard enough – and that’s just what the people of Bergen do up this stone staircase every year, around 6000 of them. No matter how fit people are, everyone has got a personal time to beat and everyone pushes with everything to get themselves to the top as fast as possible. But of course, there are those that are faster than others and this year I was to call myself one of them. I would be starting in the seeded group, who have the privilege of starting with a minute in-between each, as opposed to 10 seconds which is the norm in this time trial styled event that runs over 2 days. I have competed in this race twice already over the past years and have had ok times but the pain they cost me is truly unforgettable. The first year I started far too quickly, in fact, at the quarter way mark I think I was on time to beat the record…this didn’t happen, by half way I was done, by the top I spent 10 minutes claiming to be unable to open my eyes due to pure full body lactic overload. I got 9 minutes 16 seconds, a time I would beat in training a week later. The second year I fared better, far more prepared I paced myself within my fitness level and powered my way to the top keeping just within manageable pain levels. With a Toughest race the next day I had to take a starting slot on the Friday as opposed to the Saturday’s seeded group and therefore started in amongst some, lets say, lesser athletes. Overtaking something like 40 people on this tiny stone staircase I made it to the top in 8 minutes 48 seconds…I had beaten the 9 minute mark but would later find that this would be the first year in the over 30 year history that someone would break under 8 minutes, work was to be done. Fast forward to this year and I was unsure as to my chances of getting a new PB. Straight from over six and a half hours of racing last weekend this 900m course that climbs 300m would be a far different challenge. But still, most people gradually improve through the years as they get accustomed to the pain and technique required for this iconic challenge, so it was definitely possible. At 13:31:20 I set off. Trying to be smooth but fast on the first section which is mostly stony ramps and wider stairs I was moving but knew it wasn’t quick enough. Moving into the second section which is ‘the start of the real race’ you hit the first really steep stairs. Twisting and winding I was now feeling the pain, too hard too soon? There was only one thing for it, head down and put one foot in front of the other. At the half way mark my breathing started to sound raspy…never a good sign, and only 3:54 into the race. Section three is the crux, the longest and hardest section. Three seconds less on the first can cost you 30 seconds here. Still head down, time ticked by. About two thirds of the way up a sign says ‘Melkesyre’, ‘lactic acid’ in English, whoever put that up is pure evil. Still, this marks the beginning of the end. Three more turns with steep stairs and you are onto some slightly less steep, uneven stone ramps. These are broken up with some small steps and finally finish in a wooden staircase which marks the fourth and final section. Going from random stone stairs to uniform wooden ones is strange to adjust too, you suddenly go from bouncing around randomly to simply stepping at the same height as quickly as possible. That’s just what I was trying to do but having spent over 7 minutes in the what I can only describe as ‘the death zone of efforts’ this is easier said than done. After a few turns on the wooden stairs you are back on the rocky stuff and onto the final straight. A mixture of big boulders, rocky ramps and stairs this section is just 40m but one of the most painful. Still pumping my legs as fast as I could physically push them, I hit the wooden ramp and collapsed over the line. The entire way up I had no idea if I was going quick or slow and now I was finished I didn’t really care, simply being done was enough reward. 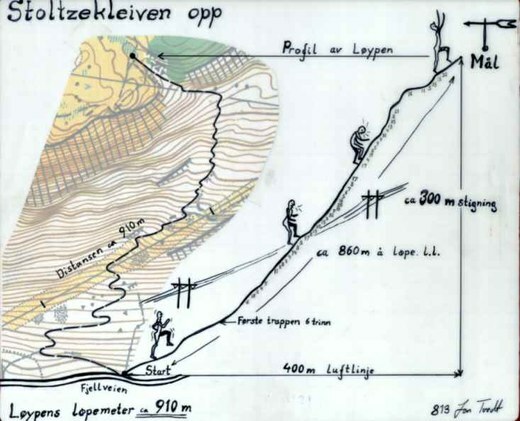 Still rasping my lungs wouldn’t feel right for hours, Stoltzen lung is an apt name. 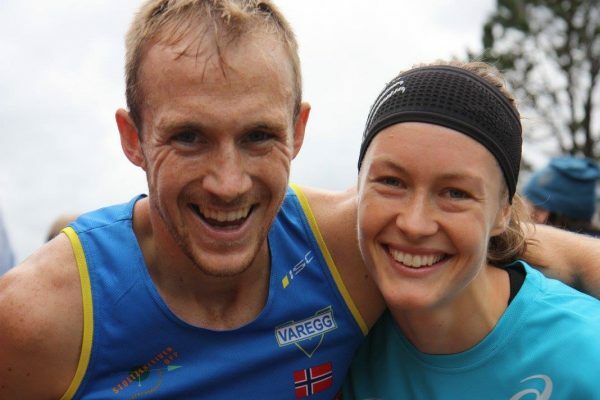 8 minutes 29 seconds was good enough for 5th, but then again Stian Angermund-Vik once joked that to get into the top 10 of Stoltzen was harder than to get the same in the Skyracing World Championships Vertical Kilometer…and he should know, he won it. This is a seriously competitive race and I am in nothing but awe of the people that get in the low 8 minutes and for the special one with under 8 minutes. In fact, if anyone wants to visit Bergen and try their hand at running up – if you beat my time I will quite happily shake your hand and buy you an overpriced Norwegian beer. If I can recommend any race to try your hand at, it would be this one. This was a fun local race that I can see myself doing every year for as long as I can but concentration now turns to the Spartan World Championships next weekend, the Toughest Final the weekend after that and the OCR World Championships after that again. Bring on the air miles! Wish me luck.